I recently got wind of the new Samsung Galaxy Note and was blown away by their promo video. The things this smartphone can do are out of this world, allowing you to draw intuitively on your touchscreen and give your pictures a personal touch. Since not everyone can get their hands on the brand-new Note, Skitch may be just the right app to bring you some of the same flair to your regular smartphone. 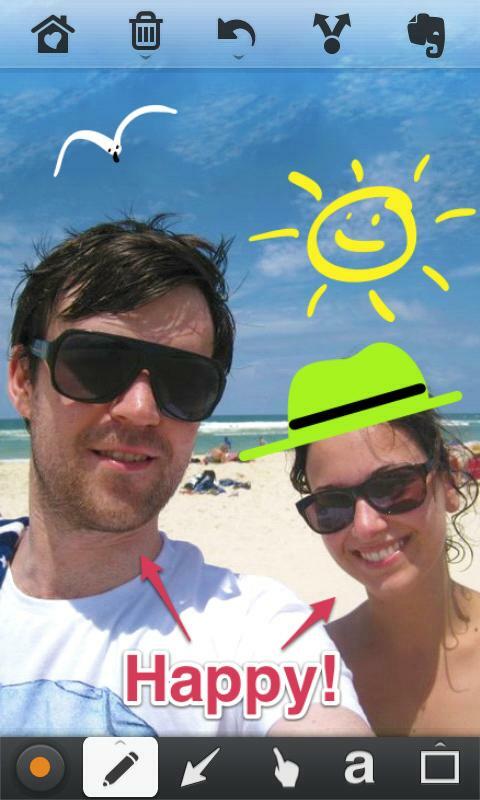 Skitch is an app that allows you to pep up your smartphone pics with the help of arrows, texts and your own doodles. 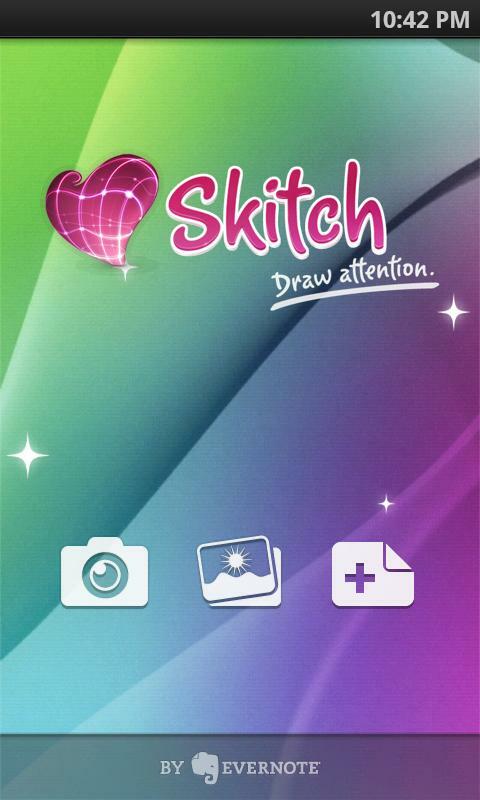 You can take snapshots using Skitch directly, import pictures from your gallery or just make drawings on your own. In the start window, you can choose whether to snap a picture, import one from the gallery or start with a blank sheet of paper. If you select to import a picture from your gallery, it is then automatically integrated into the editing window. At the top you'll find a set of standard buttons: save, undo, delete, redo, delete all and crop. By clicking on the save button, you can also share the picture via Facebook, Twitter or email. At the bottom of the window, you'll find the actual editing tools. With the button in the bottom left corner you can adjust the color and brush size. This goes for every type of artistic tool you use from pencil to paint brush. Using the next two buttons on the left, you can switch between two tools at any time. That includes the normal drawing pen as well as another tool that is a bit thicker. In addition to these two default drawing utensils, there are also some other tools at your disposal. You can, for example, create arrows by drawing your finger across your screen and then adjusting the color and size with the previously mentioned buttons. As with any Paint-like program, you can add text boxes and other shapes, including circles, rectangles and ovals. Finally, there is also a tool available to select specific strokes, layers or text. Unfortunately, there is no option for opting for different fonts. If you're an active Evernote user, you can synch up your sketches, notes and photos with Evernote with a special button. Skitch is a really simple, but awesome app. It's super easy to edit pictures and photos, and blow some life into them. There may not be a whole lot of editing tools available, but they are enough to make doodling on your pictures fun and worth your time. Anyone interested in a serious photo editing program should look elsewhere. Skitch is first and foremost designed for fun and entertainment with simple controls easy enough to use for the whole family. Using Skitch is extremely simple and intuitive to use, and it takes literally no more than a minute to get the hand of it. The placement and layout of all the tools and buttons is great and super user-friendly, making it feel like your using good old Windows Paint. Skitch runs smoothly without any crashes, lags or any of that jazz. 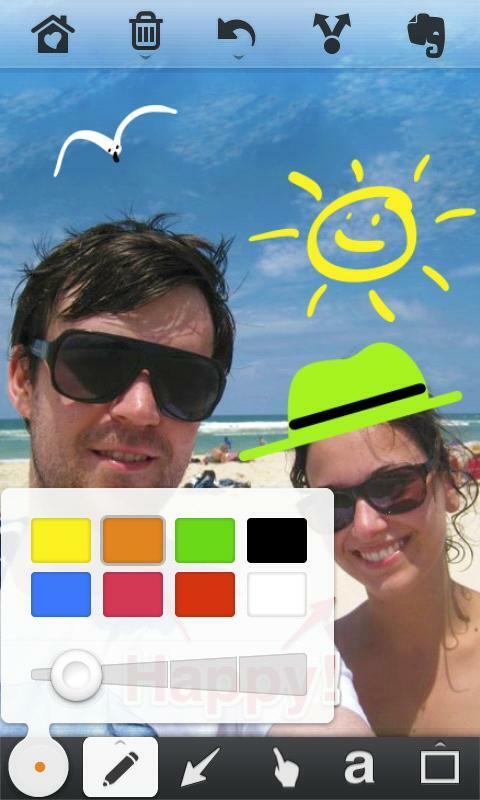 Skitch is available for free from the Android Market that is - surprise, surprise - both useful and fun. nice to draw whatever u think would match ur pictures.